Join us as vocalist Markila Sherman and guitarist Ben Sherman perform an eclectic set of some of the most popular songs from the last couple of decades. The duo has a repertoire that covers genres from Neo-Soul to Rock to Pop, and their arrangements provide a fresh take on classic popular songs. 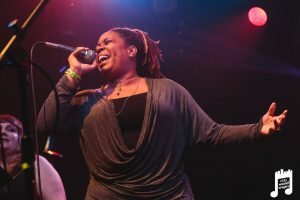 Markila Sherman is the vocalist for the local band the Buckledowns, who have performed with national touring acts Tank and the Bangas and The Marcus King Band, and whose album Hard Truths won WYEP's local album of the year award in 2017. Ben Sherman is currently a graduate student at Duquesne University, where he is studying music performance. He can been seen performing locally with the Tony Campbell Quintet.